. :: The Perils Of Show Jumping Sport - 19 ::. Well, the season to be jolly approaches. For me it just feels like the approach of a well earned break for the team and our horses!! I think this year we have navigated the globe more times than Santa Claus himself - and this Mrs. Claus definitely feels that it is time to park the sleigh and put up her feet for a couple of weeks at least until the mad new year starts and it all begins again. Yes, she does. The last few weeks have seen the team being based in Spain - we did the 5* Madrid, 2* Barcelona and last weekend the 5* show at a Coruna. 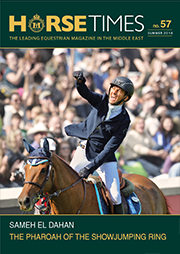 It was nice to meet up there with some of Sam’s fellow Egyptian riders, with Karim El Zoghby also competing there with some of his owners and students, and he himself had an extremely successful show with the exuberant mare Amelia being third place in Sunday’s 90,500 Euro jump-off class. We had a mixed show; Sam had to rely on the very dependable and tough WKD Pepperpot for all the big classes as Sumas Zorro didn’t feel herself on Saturday morning when I exercised her. A vet check showed that she must have maybe got cast in the box and she was very sore along the muscles in her back - nothing serious but when you are asking her to jump and stretch over 160m fences, we decided that it wasn’t fair on her and changed to Pepperpot instead. This was a big ask for Pepper as we hadn’t been planning this class with her, so her preparation was a bit lacking. We like to alternate between the two mares when it comes to jumping the big classes so we can let them relax a little between shows and conversely build them up for a particular event. However this mare is such a fighter. She was placed 11th in Friday's 90,500 Euro class, and she jumped the huge Grand Prix on Saturday just having a really unlucky eight faults. Although she battled and fought the whole way around the course which was built for the big scopey horses; Pepper is only 166cm and finds the scope in her belief that there is nothing she can’t jump!! Without the use of his second horse it was a bit disappointing for Sam and not the outcome we had hoped for - but that is the sport and throughout the year he has had some tremendous results so we can’t complain!! I however had a good show. My mare Championes was finally back after a break through injury and it was super to have this addition to my team again. She won me a fab rug on the first day when we were third and finished eighth yesterday - having completed the weekend without having touched a pole. I only jumped her the two days as she is still building up her fitness after a long break out... A difficult thing to do when you just want to get in there and jump. My other new mare Townhead Cassita also had a super show also not touching a pole - ending up seventh on Sunday in the same class as Championes. However although this was a super show, the biggest complaint I would have to say was the practice arena. At the end of the day as riders, we realise that sometimes due to location or certain factors, there are things we just have to accept and make the best of. And whilst the actual arena at Casa Novas is beautiful and massive, the warm up area was quite narrow and long - with the design of the building making it very echoey, resulting in as you can imagine, a very noisy and chaotic environment when you have a lot of horses warming up. The main problem was, however, when the two star classes (which I was competing in) were running, we also had an issue with other horses not in the classes being worked by their riders at the same time as we were trying to warm up. At one stage on Saturday when I was trying to warm up for the 14 m class with Cassita, there was at least forty combinations weaving in and out between us as we tried to come to the fences....Hectic, chaotic and not conducive to a focused preparation! Poor Cassita, who is not experienced with this sort of thing having only recently joined us and starting to compete at international shows of this type and level, was really really scared and ended up crash landing on an Oxer when she froze on takeoff as a horse and rider careered towards her. I tried as hard as I could to settle her and we appealed to the Steward's for more time - but in the end I couldn’t risk taking her into the ring as I felt that she was so scared by it all that I might end up doing more damage. It was a really difficult decision for me to make as there was a lot of money potentially at stake - and also by not jumping the big class on the Saturday I knew that there was no way that I could start her in the ranking Grand Prix on the Sunday - as she would need a class for her confidence. Anyway, as I come into land on yet another flight home, our horses are making their way to our last show of the season. This time a 2* in Portugal, where we hope for good results to finish what has been a long, tiring but very colourful year for the WKD show jumping team.... Roll on Christmas Eve where I await lots of presents from Santa as I think I deserve to be on the nice list this year! !